Chemical Safety’s iOS EH&S mobile applications are available through Apple’s App Store, our Android EH&S mobile applications are available through the Google Play Store or the Amazon Appstore and finally the Microsoft EH&S mobile applications are available at the Microsoft App Store. EMS.Inventory is an environmental health and safety iPad app and environmental health and Safety Android app for chemical inventory management available for iPhones, iPads, Android and Microsoft tablets. It allows you to manage the storage, movement and use of chemicals at the container level. EH&S professionals can view, manage and monitor chemicals as they are used and transferred to different areas of a facility. The mobile devices camera can be used to scan container barcodes. EMS.Waste is an environmental health and safety iPad app and environmental health and Safety Android app for collecting, transferring, consolidating and disposing of hazardous materials and waste. Using barcode scanners as well as the built-in camera, chemical inventory containers can be identified remotely and handled safely. EMS.Audit is an environmental health and safety iPad app and environmental health and Safety Android app that allows you to perform audits based on user created and/or user-defined checklists, and upload your answers to your EMS server. EMS.GHS (M)SDS is an Android App for MSDS and GHS labels as well as an iOS App for MSDS and GHS labels. This EH&S App was recently released for Microsoft Surface mobile devices. 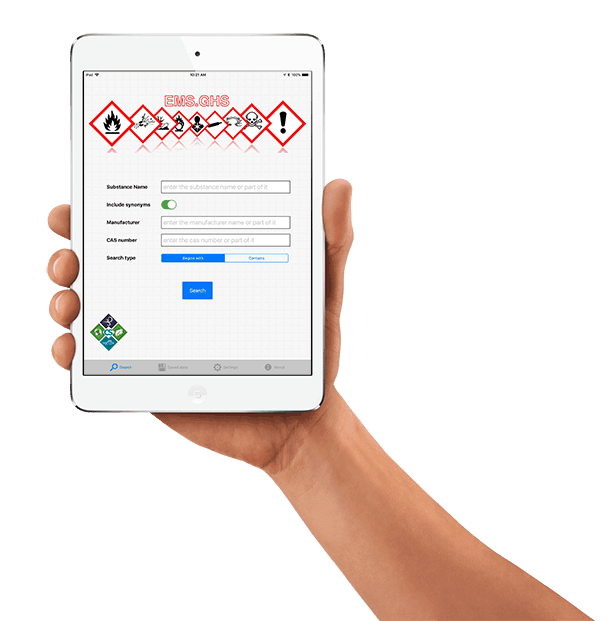 These apps are multi-lingual tools that provide wireless access to Chemical Safety’s safety data sheet database and our chemical hazard summary information database so you can quickly retrieve critical data for safety and emergency response. Chemical Safety’s EMS.GHS/(M)SDS EH&S mobile app for iOS is available through the App Store and the EMS.GHS/(M)SDS Android EH&S mobile app is available through the Google Play Store or the Amazon Appstore. Finally you can find in the Microsoft store our EMS Inventory App & our EMS-GHS App. All our applications can be downloaded and used free of charge.